What is The Watercooler Effect all about? 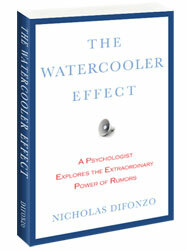 The Watercooler Effect is a deeply revealing look at why we spread rumors, why we believe them, how they mutate, and how they can be managed. During the aftermath of Hurricane Katrina, rumors were flying about stranded residents shooting rescue workers. In New York City, the Brooklyn Bottling Company’s business was devastated by false rumors that its soda contained sterilizers. Psychologist Nicholas DiFonzo has studied hearsay since 1992. In this intriguing book written for general audiences he shows that the process that gave rise to these deeply troubling rumors is fundamentally the same as tête-à-tête around the company watercooler. Why are rumors a ubiquitous aspect of human experience, whether about plots to wipe out the urban poor through sterilizers or a company’s plan to downsize? Armed with entertaining examples from all spheres of life, DiFonzo asserts that rumors are a window into both individual and group psychology. DiFonzo ultimately argues that rumors arise from our deeply rooted motivation to make sense of the world. As social beings, when confronted with an ambiguous or threatening situation, our response is to talk to one another—whether at the dinner table, on the Web, or around the watercooler.